PNR, day 6: baseball's best, or is he? 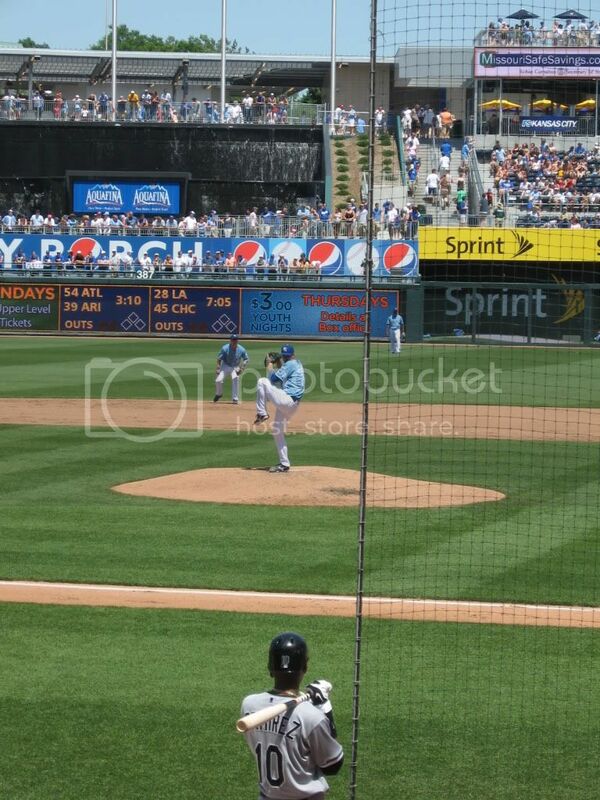 The Royals' Zack Greinke throws against the Chicago White Sox. The first pitch of last Sunday's game between the Chicago White Sox and the Kansas City Royals was scheduled for 1:10 p.m. Central time. Given that I awoke that morning in St. Louis, an early up-and-out would be needed to make it there and secure a seat in time. So it was that I left the Gateway City before 8:30. That might have been too early a departure. When I stopped for gas in Kingdom City, I realized that I had enough time for a brief detour to Nostalgiaville, USA. It's a nice little shop right off Interstate 70, with a lot of cool chotchkies. Then it was on to Kansas City...and straight into the Truman Sports Complex, right off 70, site of both Arrowhead and Kauffman Stadiums. The whole reason I was going to this game was to watch one Zack Greinke. At the time of the game, he sported the lowest ERA in Major League Baseball, at 0.84. When I reached the ticket window, I had to ask the sales lady what hand Greinke threw with; when she said he was a righty, I chose seats on the third-base side. And what seats they were! Eleven rows up from the field, about the closest I have ever been to the action. I once went to a Mets game and sat in the orange "field level" seats at old Shea, but I think these were closer. And I didn't pay for those other ones. Given the tight timetable on getting to the ballpark, I had lunch there. This was a cavalcade of follies. First, I spilled my soda. That got refilled, but the fries that I spilled afterward were not. Finally, I found my seats, settled in, and enjoyed a beautiful (if hot) day at a wonderfully renovated ballpark. Greinke, however, did not have his best stuff. He allowed four runs - three of them earned, ballooning is ERA to 1.10 - and struck out seven over as many innings. Despite the seemingly bad scoreline, Zack came with his good stuff when it mattered most - in the sixth and seventh, when his control helped to hold the game tied at four. He was lifted at the start of the eighth, but it wasn't until the ninth that the White Sox broke through for three to take the game 7-4. Given the Royals recent (read: last two decades) history, I wasn't surprised. I rolled myself into downtown Kansas City for some pictures. What I saw there confirmed what I suspected - it might be something worth taking in at another time, but not at five o'clock on a Sunday afternoon. Somehow or other, I found my way around the construction on the northbound I-35, and finally reached I-29. I laid up near the airport, got dinner, wrote and posted the entries on Louisville and St. Louis, and that was basically it.